In campaigns, maraming volunteers na sumasali. Pwedeng maglagay ang isang ‘hater’ para sirain ang taong kung sino man. Madaming supporters si Senator na nagbibigay din ng tulong. So, hindi natin alam kung kanino nanggaling yan. isa ako sa mga nagvolunteer para mag re-pack sa WCC, office ni Senator Villar. Wala kaming nilagay na kahit isang pangalan sa mga packed lunch. It’s sad kasi 72 hours ka na nagrerepack at tumutulong sa mga victims, ganito pa yung makikita mo. Meron din mga generous friends and mga nagdonate ng ready to distribute packed lunch, and we did not bother to check them kasi kailangan mabilisan ang galaw, so lagay lahat sa trucks. Meron din namang mga friends na dumretso na agad sa affected areas at tumulong in behalf of the good Senator. Shempre, tumutulong sila, hindi natin alam kung ano ang nakalagay sa mga pinamimigay nila. WOW, “Tulong mula kay Manny Villar”. So kindly tell us, Is that going to be done until kingdom come? or Is it only for now that you are campaigning for the Top Post in the Government. Why don’t he just follow Senator Legarda’s move and not run and just proceed with humanitarian projects if he truly is sincere. Power is not needed to perform philantrophy, Sincerity and Caring does. “FYI”. @amdg: The saying goes “no good deed goes unpunished.” It’s apt, isn’t it? Seriously, though. Great job, guys. I’m curious. Did Villar use public money or his private funds for his relief work? @Jun: I have a feeling you’ve been here before. You have a valid point.We don’t know if Sen. Villar would have helped out if either he wasn’t a senator, or wasn’t running for office. Then again, I don’t think that matters to whoever got the food. 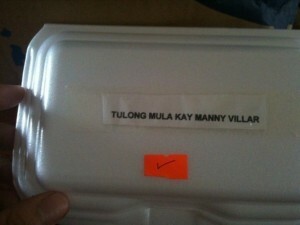 It’s a bit sleazy, but as amdg said, Sen. Villar may not have had anything to do with the stickers. @FinderKeeper: I find it curious that amdg, who happens to be a volunteer for Sen. Villar, just happened to stumble on the post.Still, the alternative is that Sen. Villar actually has people monitor blogs to see what people are saying about him, and that we’re big enough to monitor. Not being paranoid enough, amdg probably really just stumbled in. It’s sad that even relief efforts can be colored with politics. Hats off to Sen. Richard Gordon and the Philippine National Red Cross, by the way. He’s been on the ground since Saturday, and not once did I hear anything from him about 2010. We have a twitter account, and you can post comments here. We’re not on facebook because we’re afraid to find out that people don’t want to be our friends. @joyful: amdg says some of the stuff was donated by generous friends of the good senator. Friends like Sen. Willie Revillame, I suppose. Maybe he had them do a little dance before feeding them. whether it was Villar\’s side or not who put the sticker, it was always known to us that Villar and Willie are generous in nature. if you could watch wowawie you would know how generous Willie is. @tarantula: What does generosity have to do with leadership, though? It’s a calamity, so, sure, relief goods are needed. But generosity as a policy? Does Villar’s alleged generosity mean he’ll make a good president? Does Revillame giving away money during his shows mean he’ll be a good legislator? I’m not sure that that’s even his money. Could it have come from sponsors and balikbayan donors? @onetamad: yeah… maybe u are right about that. don’t get me wrong, i’m not campaigning for them. for what i know they are indeed generous. i don’t care if like it or not. i’m not saying that a generous person would certainly become a good president. what i’m trying to say is that a generous person certainly feels empathy towards others thats why they gave. teodoro or noynoy may have a very good educational background but, i opinion is this – those who have a very good educational background (or should i say intelligent people) are also very good in hiding their corruption. it can\’t be denied that all our opticians are corrupt. For me, i would rather choose the better person than the better education. this is just my opinion i don’t care what you think. thanks! @tarantula: Villar went to UP for both his undergraduate and graduate studies. Hmm. In the case of Wowowee, is the show giving away money because Willie feels empathy for the poor? Or because it’s what the crowds want? If the point was to give away money or livelihood packages, etc, then why not just do that? Much as I disagree with him on some things, Sen. Gordon had it right when he said that media allows politicians and personalities to project an image of themselves that is not necessarily real. Well, thanks for not caring what I think. @onetamad: FYI, wowowee started about 3yrs ago. since then they started giving. it was obvious that their generosity is not intended for 2009’s election. @tarantula: Obviously not. There’s a windfall though, right? Ratings equals sponsors, advertises, etc. Anyway, I get what you’re saying. You’re voting for generosity instead of education. tarantula, as onetamad pointed out, Wowowee is giving out money and gifts that are paid for by sponsors and advertisers. It’s not coming out of Willy or ABS-CBN’s pockets. Wowowee is not a non-profit charity. It’s a TV show designed to, in the end, make money for ABS-CBN. Their giving away prizes is not generosity. It’s a business plan. Several members of my family received packed meals and relief goods from Senator Manny Villar’s camp during the height of the typhoon Ondoy. WALANG sticker and mga plastic bags at ang mga styro containers ng pagkain. Yang nasa picture, hindi natin alam kung sinong naglagay niyan. Pwede namang kahit sinong supporter or detractor na kumilos without the senators direction or specific instrucions. Pwede ngang ginawa lang yan ng kung sino na di naman kasama sa binaha. I find it hard to believe that anybody trap on their rooftops or at some shelters found time to take a picture of a freakin food and post it online. Huwag naman sanang manira ang mga tao diyan. More than 24 hours na walang pagkain ang mga relatives ko because they were trapped on their rooftops. Buti na lang dumating ang trucks na pinadala ng sentaor. Walang sign yun. At first di nga nila alam na kay Senator Villar yun, kaya lang nagtanong yung isang kagawad ng barangay kung sino daw nagpadala ng pagkain. Maybe it’s true that they are extra nice because the election is near, but heck, help was needed. And their help came. And for that we are grateful. Stop this crab metaliy attitude. It’s really not doing anybody any good. Stop this crab mentality attitude. It’s really not doing anybody any good. si onetamad obvious na minamanok si gordon kaya skptic ke villar. etong kwento abt some red cross missions, release of goods to helpless victims of ondoy were deferred bec sen.gordon was not yet around to personally hand them over. pati photographer nainip daw. i was skeptic about the upcoming election until i had the chance to personally listen to sen villar and his plans for the country. contrary to a few that i’ve listened to, his plans are concrete, the subjects specific, and the timeframe of plans clear. historical animosities with previous officials were never ncluded in his battlecry. simply put, no drama. he’s not ashamed of his achievements and he wants to extend the organizational successes and even lessons he had to the rest of the nation. in a radio program (89.9), another chance i got to listen to him, he said he sees the 1st yr as president to do incremental impact. people must be inspired and work with the govt and that should happen in the first year. he also explained the ads to level the field in terms of popularity. my take, drama sells well in our society. other candidates have lots of personal drama to offer and he sees informing the public about his capabilities as a requirement for his objective to be realized. gibo-he has gma and her resources. credentials are ok but the shadow dubious. noynoy-anong nagawa nya? like sa hacienda luisita, mas mahirap ba problma dun kesa sa problema ng buong pilipinas? ung di nmatay si pres cory, tatakbo ba sya? wala daw anomaly, meron bang nagawa? dito sa ‘pinas ang hinog ang pinupukol. e kung basyo in the 1st place? chiz-isa pang puro salita. sinong anino sa likod? natuwa ba ang mga taga-sorsogon nung congressman pa sya? me long-term objectve, maraming salita, pa-safe ang gawa, aasang merong tumaya, ayan na si danding. villar-efficient ang approach, nakapagpalago ng negosyo. dati worried din ako bec of c-5 project. ngayon me result na. compared w/ gibo, mataas din ang pinagaralan. compared ke noynoy, matibay din ang pamilya at aktibo ang mga anak. ke chiz? wala e. puro salita lang si chiz. yun lang. tama na ang drama and emotion. we need more results and less talk. @sim: Balikan mo ang mga naunang mga post tungkol kay Gordon. Makikita mo na binabaterya ko rin siya. Trapo si Villar. Kahit isang libong ad pa ang ipalabas niya, di mababago yun. bakit ba palagi nalang may nananira sa mga mabuting gawa nang ibang tao? perhaps, attitude na talaga ito nang isang pilipino. dito sa pinas whether mabuti man o masama ang ginagawa ng isang tawo, may mga tawo paring nag cri-criticize. dahil yung mga nag criticize gusto nilang makalamang kaya nila sinisira ang kabutihan nang iba. si onetamad isa na sa sample dun. lol.. sino ba talaga ang gusto mong gawing bida sa politika onetamad? sino ba ang manok mo? parihas lang kayo ni escudero walang magawa kundi paninira nang iba.lol..
@hotKisses – Hindi para “makalamang” ang punto ng criticism. Kailangan ang criticism upang umunlad tayo dahil hindi maaring mapagpabuti ang anumang tao, bagay, pelikula, etc. kung hindi mo masasabi kung ano ang mali o pagkukulang nito. @hotKisses: Wala akong minamanok. Wala akong ine-endorse na politiko, at kung meron man, yun ay gagawin ko sa personal na paraan at hindi rito. Si Sen. Escudero man ay tinira na rin natin sa blog na ito. Ang pamagat ng post na ito ay halaw sa kasabihan sa Inggles na “no good deed goes unpunished” na mismong pinupunto mo. Kung babasahin mo ang post, at maikli lang naman, makikita mo na wala akong sinabi tungkol kay Sen. Villar. Pero yamang nariyan na tayo, parang pangit naman na tutulong ka nga pero may nakadikit na sticker ng pangalan mo. Idagdag mo na deklarado na na tatakbo si Villar sa 2010. Hindi ba’t pangangampanya na ito? Oo nga’t may natulungan siya, pero nakulayan pa rin ng politika ang pagtulong na ito. Kaduda-duda tuloy ang pagka-sinsero ng kanyang pagtulong. @sGj: Wala sa dami ng ads ang dami ng nagawa. Kung titignan mo ang mga ad ni Villar, wala namang sinasabi doon kundi ang mga maling akala tungkol sa kanya, ang paglaki niya sa Tondo at kung gaano sila magkaibigan ni Boy Abunda. @tarantula: Don’t be so judgemental regarding bloggers my friend. First of all this is a site where we are suppose to express our opinions and blurt what we know is true, not fight other bloggers to make a point. Believe me brother, that’s not the right way. Kindly not defend Willie and Wowowee wholeheartedly, you have no idea of what happens when the camera stops or when the show ends. It is showbusiness, and that is what you should always consider. They are all SHOW with only a fraction for sincerity. They (Networks and shows) need to give out reliefs to MOSTLY APPEASE their FANS. NOT ALL THAT GLITTERS IS GOLD my friend. Also consider what other bloggers think, not just yourself. God Bless. @onetamad: Yes, you can say that. I was involved with a foundation before that relocated informal settlers in Las Pinas when he was still congressman of Las Pinas. Guys, don\’t be judgemental on other bloggers. This site is for exchange of ideas and comments of SUBJECTS. Try to be open minded.